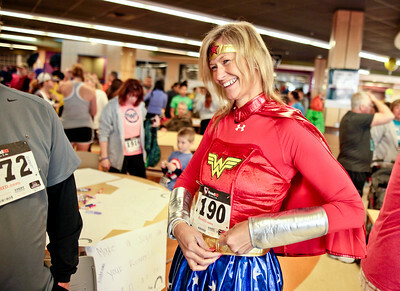 Michelle LaVigne/ For Shaw Media Robin Doeden of Lake in the Hills attaches her bib before the start of the McHenry County Human Race, held at McHenry County College on Sunday April 24, 2016. 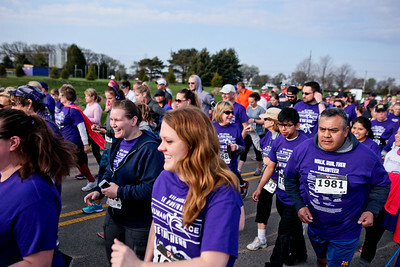 Participants chose which charity they want their race fee to benefit and Doeden was running to support the McHenry County Community Foundation charity. Michelle LaVigne/ For Shaw Media Dan Keppel of Spring Grove, or "Dr. Love," takes his medal for completing the McHenry County Human Race held at McHenry County College on Sunday April 24, 2016. Keppel was running in support of Habitat for Humanity. He chose his outfit and superhero character based around the heart decorated boxers he already owned. "I had to find something to go with my shorts." 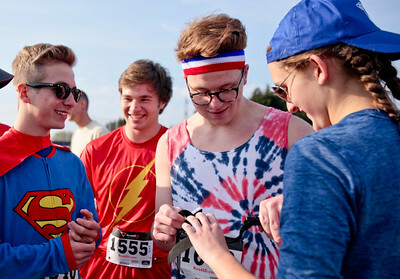 Michelle LaVigne/ For Shaw Media Left to right, 16-year-old Jack Warnecke of Cary, 18-year-old Blaise Moller of Fox River Grove, 18-year-old Evan Petrow of Fox River Grove, and 17-year-old Kelsey Krigas of Fox River Grove prepare for the the McHenry County Human Race held at McHenry County College on Sunday April 24, 2016. 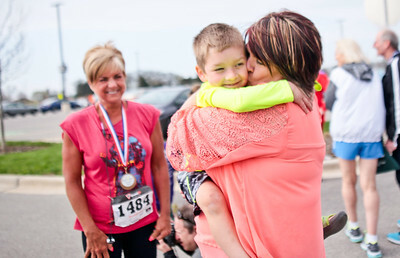 Michelle LaVigne/ For Shaw Media Participants of the McHenry County Human Race begin their 5K trek at McHenry County College on Sunday April 24, 2016. The runners choose which charity they wanted their race fee to benefit. 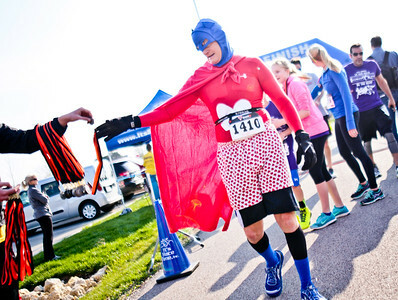 Michelle LaVigne/ For Shaw Media Wearing all blue and a cape, Greg Bielak of Lake Zurich heads to the finish line at the McHenry County Human Race held at McHenry County College on Sunday April 24, 2016. 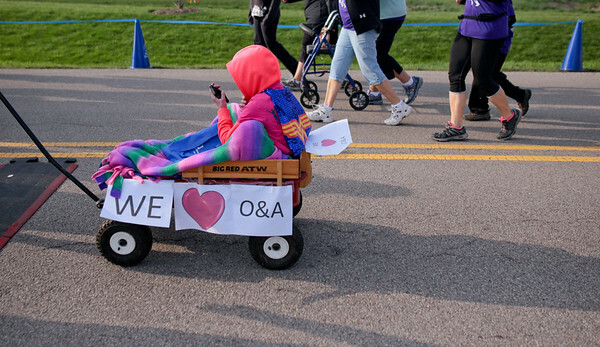 Michelle LaVigne/ For Shaw Media Ten-year-old Katie Thomas of Bull Valley is able to hitch arride from her dad during the McHenry County Human Race held at McHenry County College on Sunday April 24, 2016. 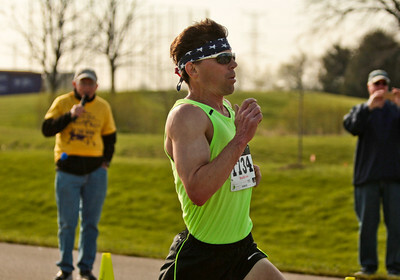 Michelle LaVigne - For Shaw Media The first place runner of the McHenry County Human Race held at McHenry County College on Sunday April 24, 2016, Christ Setzler of unincorporated Wonder Lake, crosses the finish line. Settler chose to support the BraveHearts Therapeutic Riding charity, which provides equine-assisted activities and therapies for those in need of special care. Michelle LaVigne/ For Shaw Media Fourteen-year-old Daniela Bandala of McHenry and her running companion Midnight, near the finish line McHenry County Human Race held at McHenry County College on Sunday April 24, 2016. Bandala and Midnight were running for Garden Quarter Neighborhood Resource Center, a center of education and support for children. Bandala said Midnight was a help during the whole race. "He makes me run." 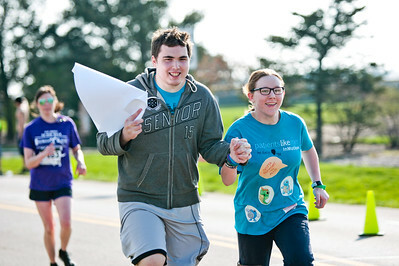 Michelle LaVigne/ For Shaw Media Griffon Carroll of McHenry joins Taylor Clemons of McHenry to help her finish out the McHenry County Human Race held at McHenry County College on Sunday April 24, 2016. 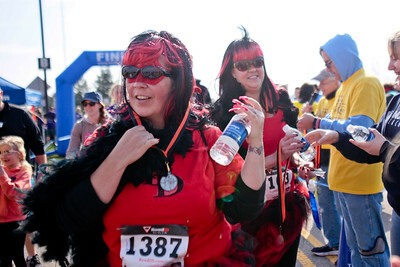 Michelle LaVigne/ For Shaw Media Running for Horizons for the Blind, Dawn Jurkiewicz of Johnsburg and Lisa Dahlke of Lakewood, grab some water as they finish out the McHenry County Human Race held at McHenry County College on Sunday April 24, 2016. 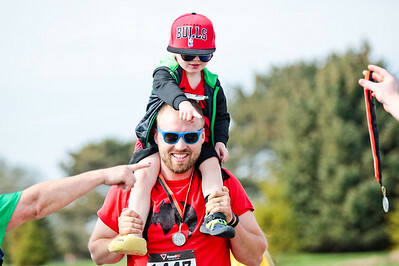 Michelle LaVigne/ For Shaw Media While getting ride from his dad Drew Kunde of Woodstock, two-year-old Dylan is handed a medal after completing the McHenry County Human Race held at McHenry County College on Sunday April 24, 2016. 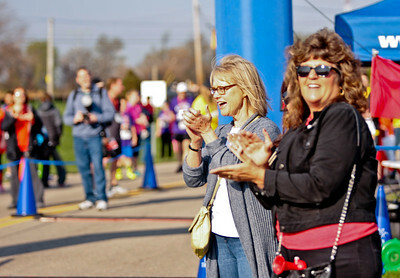 Michelle LaVigne/ For Shaw Media While waiting for their children to cross the finish line, Marcy Pickos of Woodstock (furthest,) and Janet Rosenbach of Huntley, cheer on the runners in the McHenry County Human Race held at McHenry County College on Sunday April 24, 2016. 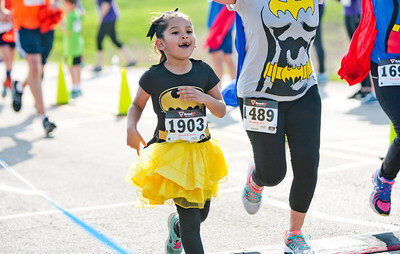 Michelle LaVigne/ For Shaw Media COVER Dressed as batgirl, six-year-old Aliza Roman of McHenry crosses the finish line of the McHenry County Human Race held at McHenry County College on Sunday April 24, 2016. 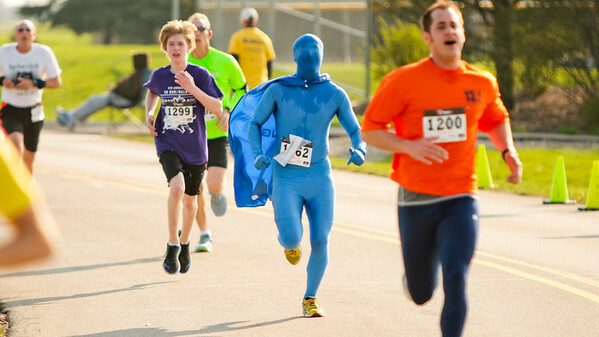 Roman was running to support the Court Appointed Special Advocates (CASA) of McHenry County which helps give foster children who are victims of abuse a voice in court. 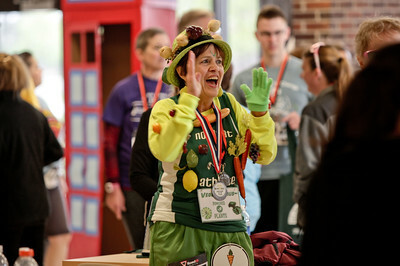 Michelle LaVigne/ For Shaw Media "Vegan Venus," also known as Joan Davin, cheers on her friends during the awards ceremony at the McHenry County Human Race held at McHenry County College on Sunday April 24, 2016. Davin ran the race to promote a plant-based eating lifestyle. 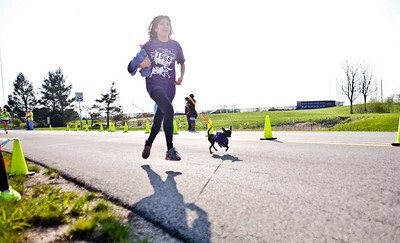 Fourteen-year-old Daniela Bandala of McHenry and her running companion Midnight, near the finish line McHenry County Human Race held at McHenry County College on Sunday April 24, 2016. Bandala and Midnight were running for Garden Quarter Neighborhood Resource Center, a center of education and support for children. Bandala said Midnight was a help during the whole race. "He makes me run."